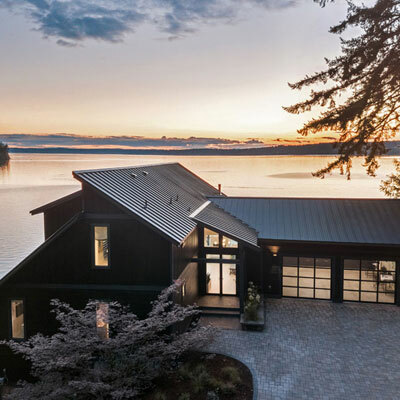 For its 2018 Dream Home, HGTV selected a 3,500-square-foot waterfront home in Gig Harbor with breathtaking views of Henderson Bay. After an extensive remodel, the home is nothing short of stunning. Floorto-ceiling windows in the great room showcase the waterfront. Plenty of outdoor living space ensures the new owners will enjoy the beauty of the Pacific Northwest year round. Local contractor Choice Construction was selected as this year’s builder. We caught up with Adam Clark, president of Choice Construction, to find out what it was like to be part of such an exciting project. What was your favorite part of the process? Our favorite part was working with a team of professionals to properly design and build their vision. Working with a professional team of designers and builders really made all the difference. Being able to see the “behind the scenes” of a project like this was a lot of fun as well. There are really too many to count. Driving down to the property surrounded by privacy, then stepping through the front door and being greeted by the view is great. The open kitchen out to the deck is also nice for entertaining. The timeline. With film crews showing up during construction, there were days with short notices, so we couldn’t work. We still had to complete everything in time for the final production crew. Having the whole team work together and make suggestions really ensured the success of the project. What’s next for Choice Construction? We will continue to focus on partnering with owners and architects to collaboratively build custom homes and remodels. We have a great team in place and we want to work with people to build something special.